Selenium: Mineral information, data and localities. From the Greek "selene," the moon, in allusion to tellurium. 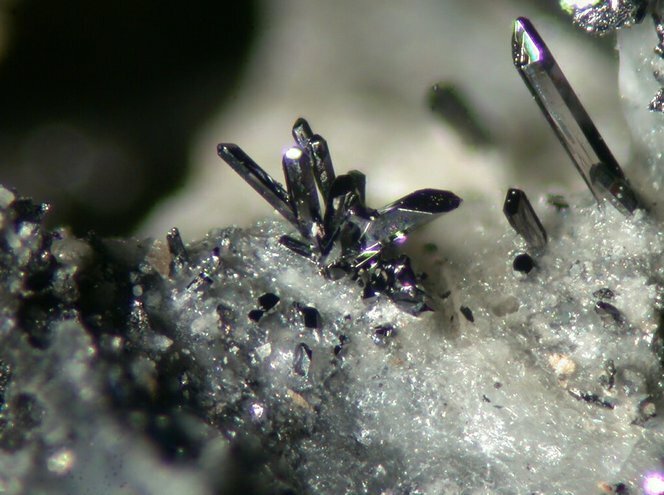 This page provides mineralogical data about Selenium. Francevillite 2 photos of Selenium associated with Francevillite on mindat.org. Molybdite 1 photo of Selenium associated with Molybdite on mindat.org. Quartz 1 photo of Selenium associated with Quartz on mindat.org. Carnotite 1 photo of Selenium associated with Carnotite on mindat.org. Tangeite 1 photo of Selenium associated with Tangeite on mindat.org. Metatyuyamunite 1 photo of Selenium associated with Metatyuyamunite on mindat.org. Calcite 1 photo of Selenium associated with Calcite on mindat.org. Palache, Charles (1934) Contributions to crystallography; claudetite, minasragrite, samsonite, native selenium, indium. American Mineralogist: 19: 194-205. Palache, C., Berman, H., Frondel, C. (1944), The System of Mineralogy of James Dwight Dana and Edward Salisbury Dana Yale University 1837-1892, Volume I: Elements, Sulfides, Sulfosalts, Oxides. John Wiley and Sons, Inc., New York. 7th edition, revised and enlarged, 834pp. : 136-137. Avilov, A.S., Imamov, R.M. (1969) The structure of selenium. Soviet Physics - Crystallography: 14: 259-260. FOGLIATA, Ana S. y AVILA, Julio C.. El yacimiento de estaño Vil Achay, Catamarca. Rev. Asoc. Geol. Argent. [online]. 2004, vol.59, n.1, pp. 83-90. Recursos Minerales de la Republica Argentina, E. O. Zappettini Ed., Buenos Aires 1999 ISSN 0328-2325; de Brodtkorb, M. K.; Gay, H. D.; Sureda, R. J. (1993): Polymetallic selenide-sulfide minerals of the Los Llantenes mining district, La Rioja, Argentina. Maurice, Yvon T. (Ed. ), Proc. 8th Quadrenn. IAGOD Symp., 119-125. Simpson, E.S. (1938), Some New and Little Known Meteorites Found in Western Australia, Mineralogical Magazine: 25 (December, 1938): 157-171. Meixner, H. (1954): Neue Mineralfunde in den österreichischen Ostalpen XIII.- Carinthia II, 144./64., 18-29.
ⓘ Gilly North Colliery ? Petrov, A., Smith, B., Smith, C. (2001) A Guide to Mineral Localities in Bolivia. Mineralogical Record Vol.32(6), pp. 457-482. Hurlbut, C.S., Aristarain, L.F. (1969) Olsacherite Pb₂(SeO₄)(SO₄), A New Mineral from Bolivia. The American Mineralogist. Vol.5, November-December, pp. 1519-1527. J. A. Mandarino (1965): Molybdomenite from the Ranwick uranium mine, Montreal River area, Ontario. Can. Mineral. 8, 149-158. Sabina, A.P. (2003) Rocks & Minerals for the collector; Kirkland Lake - Rouyn-Noranda - Val d'Or, Ontario & Quebec. GSC Misc. Report 77, 128 p.
Zhu Jian-Ming, Zheng Bao-Shan, Su Hong-Can, Li She-Hong, Mao Da-Jun, Lei Ping, and Finkelman, R.B. (2001): Geochimica 30(3), 236-241; Caixia Feng, Jiajun Liu, and Shen Liu (2002): Mineral Deposits 21(suppl. ), 812-815; Linbo Yao and Zhenmin Gao (2002): Mineral Deposits 21(suppl. ), 837-840; Handong Qian, Zhenghua Zhao, Xiang Zheng, Chengyi Lin, Jiahu Zeng, Xuemei Wu, and Wu Chen (2006): Acta Geologica Sinica 80(11), 1706-1710; Zhu, Jian-ming; Johnson, Thomas M.; Finkelman, Robert B.; Zheng, Bao-shan; Sykorova, Ivana; Pesek, Jiri (2012): The occurrence and origin of selenium minerals in Se-rich stone coals, spoils and their adjacent soils in Yutangba, China. Chemical Geology 330-331, 27-38. Matýsek D., Skupien P.: The origin of native selenium microparticles during the oxidation of sideritic mudstones in the Veřovice Formation (Outer Western Carpathians). Geologica Carpathica, 2015, 66, 4, 303-310. Sejkora J., Škoda R., Pauliš P. 2006: Selenium mineralization of the uranium deposit Zálesí, Rychlebské Hory Mts., Czech Republic. 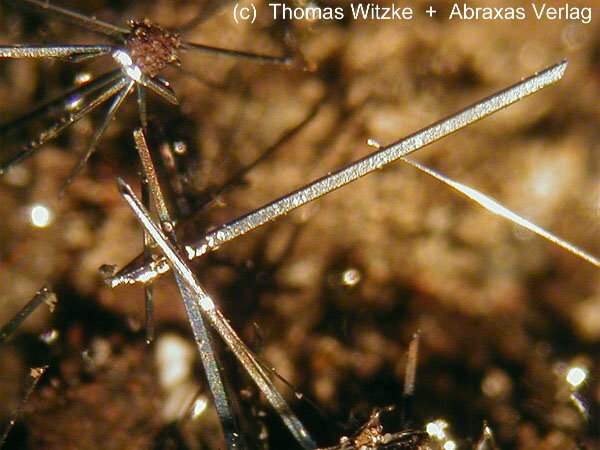 Mineralogia Polonica - Special Papers, vol. 28, 196-198; Sejkora, J., Pauliš, P., Škoda, R.: Uranové ložisko Zálesí v Rychlebských horách. Minerál, 2007, roč. 15, č. 4, s. 305-238. Chauris, L. (2014) Minéraux de Bretagne, Les Editions du Piat, 43. Blaß, G. and Strehler, H. (1993): Mineralbildungen in einer durch Selbstentzündung brennenden Bergehalde des Aachener Steinkohlenreviers. Mineralien-Welt 4 (4), 35-42. 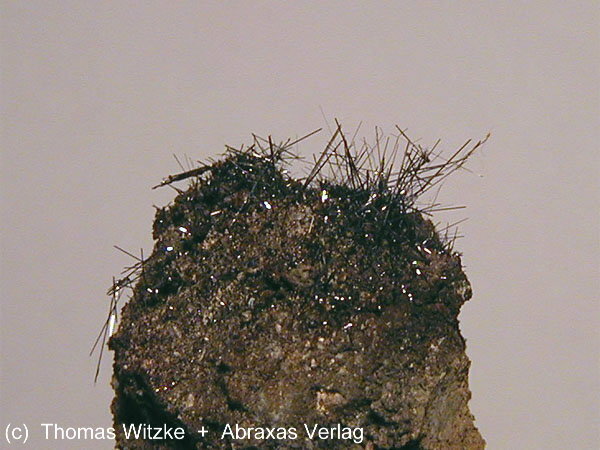 (in German); Witzke, T., de Wit, F., Kolitsch, U. and Blaß, G. (2015): Mineralogy of the Burning Anna I Coal Mine Dump, Alsdorf, Germany. Chapter 7, pp. 203-240, in: Stracher, G. B., Prakash, A. and Sokol, E. V.: Coal and Peat Fires: A Global Perspective, Volume 3: Case Studies - Coal Fires, Elsevier, 786 pp. Wittern: "Mineralfundorte in Deutschland", 2001; Tischendorf, G. (1969). Sources of elements in selenide mineralization near Tilkerode (Harz). International Geology Review, 11(11), 1298-1301. Mariani & Scaini, 1978. I minerali d'Italia. Rizzoli Ed., Milano. QUERCIGH E. (1935): Sul solfoselenio di Vulcano (Isole Eolie). - Rendiconti dell' Accademia delle Scienze Fisiche e Matematiche di Napoli - 32, 3-7.
ⓘ Bereznyakovskoe Au deposit ? Spiridonov, A. M., Kulikova, Z. I., Zorina, L. D., Granina, E. M., Parshin, A. V., & Budyak, A. E. Material Composition of Ores and Metasomatically Altered Rocks at Bereznyakovskoe Epithermal Gold Ore Deposit (the South Urals). Pekov, I. (1998) Minerals First discovered on the territory of the former Soviet Union 369p. Ocean Pictures, Moscow; Belakovski D.I.. Die Mineralien der brennenden Kohlefloze von Ravat in Tadshikistan, Lapis, 1990, N 12 p.21-26. (in German); Nasdala, L., & Pekov, I. V. (1993). Ravatite, C14HIO, a new organic mineral species from Ravat, Tadzhikistan. Eur. J. Mineral, 5, 699-705. Anthony, J.W., et al (1995), Mineralogy of Arizona, 3rd.ed. : 366; Galbraith, F.W. (1947), AZ Bur. of Mines Bull. 153, Minerals of AZ: 12; Palache, C. (1934), Contributions to crystallography: Claudetite, minasragite, samsonite, native selenium, iridium, Am.Min. : 19: 194-205; Korbel & Novak, 1999. Minerals Encyclopaedia, p.17. Kampf, A. R., Nash,P., and Loomis, T.A. (2013): Phosphovanadylite-Ca, Ca[V#4#+^4P^2O^8(OH)^8.12H^2O, the Ca analogue of phosphovanadylite-Ba. American Mineralogist 98,439-443. Howard, D and D. Thomssen (2000) Occurrences of Native Selenium in Nevada; USA Micro Probe, newsletter of the NorthWest MicroMineral Study Group, Spring 2000, Volume 1X, Number 1, pgs 15-17. [MinRec 32:297]; Howard, D and D. Thomssen (2000) Occurrences of Native Selenium in Nevada; USA Micro Probe, newsletter of the NorthWest MicroMineral Study Group, Spring 2000, Volume 1X, Number 1, pgs 15-17. American Mineralogist (1977): 62: 316-320. Smith, A.E. (1991), Texas Mineral Locations Index, Rocks & Min. : 66(3). Collected by and in the collection of Brent Thorne. ; Kasatkin, A.V., Plášil, J., Marty, J., Belakovskiy, D.I., Lykova, I.S. (2014): Nestolaite, CaSeO3·H2O, a new mineral from the Little Eva mine, Grand County, Utah, USA. Mineralogical Magazine, 78, 497-505. Rocks & Minerals: 68(6): 398-400.
ⓘ Franklin Mine (Deep Run Mine) ? Page, L. R.; Stocking, H. E.; Smith, H. B. (1956) Contributions to the geology of uranium and thorium by the United States Geological Survey and Atomic Energy Commission for the United Nations International Conference on Peaceful Uses of Atomic Energy, Geneva, Switzerland, 1955. USGS Professional Paper 300 pp361-370. Solodov, I.N., Nesterova, M.V., Shugina, G.A., Ganina, N.I., Shulik, L.S., and Solodov, D.I. (2001): Lithology and Mineral Resources 36(1), 43-62.